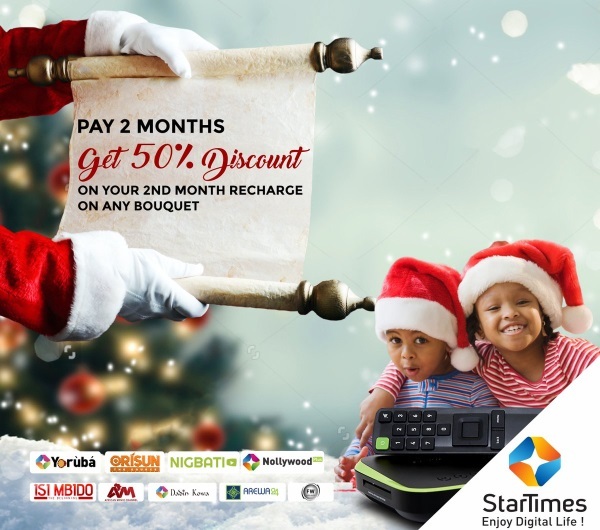 Ahead of the 2018 Christmas celebration, Pay TV Company, StarTimes has announced a 50% discount off subscription rates, in a bid to entice the existing subscribers across the country. According to the company, the offer has started from December 1 till January 31, 2019. StarTimes is a leading digital TV-operator across Sub-Saharan Africa. StarTimes' arrival on African market disrupted traditional model of TV industry by making Pay TV affordable to every family and not only to the upper class. As of September 2018, StarTimes operates in 30 countries and serves 20 million users.